In a recent volume of the magazine “British Birds” (June 2008, Volume 101) there was an extensive article by the Rare Breeding Birds Panel detailing the status of the rarest breeding birds in the UK in 2005. On Arran we are fortunate to have breeding populations of the following species that featured in the article: Red-throated Diver, Hen Harrier, Golden Eagle, Peregrine Falcon, Barn Owl, and Common Crossbill. The Red-throated Diver population on Arran is one of the most southerly in Scotland. 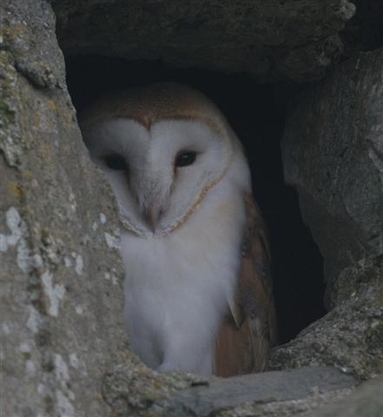 The Barn Owl population on Arran has been greatly helped in recent years through co-operation between people and organisations on the island. Drums from a local company, “Arran Aromatics”, have provided additional nest sites. These were put in place by the Wildlife Officer of the Forestry Commission, and the nest sites have been monitored by the local bird ringer. This breeding Barn Owl scheme is being successful, with young birds from Arran nest sites being found in Campbeltown and Skye. Arran is internationally important for Hen Harrier. In the article in “British Birds”, Argyll, Bute and Arran were reported to have one hundred and eleven occupied breeding territories, with forty-nine territories fledging young. This is considerably more than the whole of England and Wales put together. In other parts of Scotland, Orkney had thirty-three territories that fledged young, the Outer Hebrides thirty-two, and the rest of Scotland sixty-one. This data is collected by dedicated individuals including members of the Scottish Raptor Group who are licensed to do the job.